Whitley is a Poodle, Terrier mix who came to Real Good Dog Rescue along with her buddy, Emeril. She was a real sweetheart in her time with us, even though she tested positive for heartworms and had to undergo that treatment. I’m pleased to report that Daisy has achieved two milestones: She is heartworm negative on her follow-up test and she has logged her first hundred miles in power walking. Thought that you would like to hear the good news on both accounts. The good life continues for all of us. We are so pleased to hear of Daisy reaching these milestones. This is wonderful news! Thanks for taking the time to let us know! 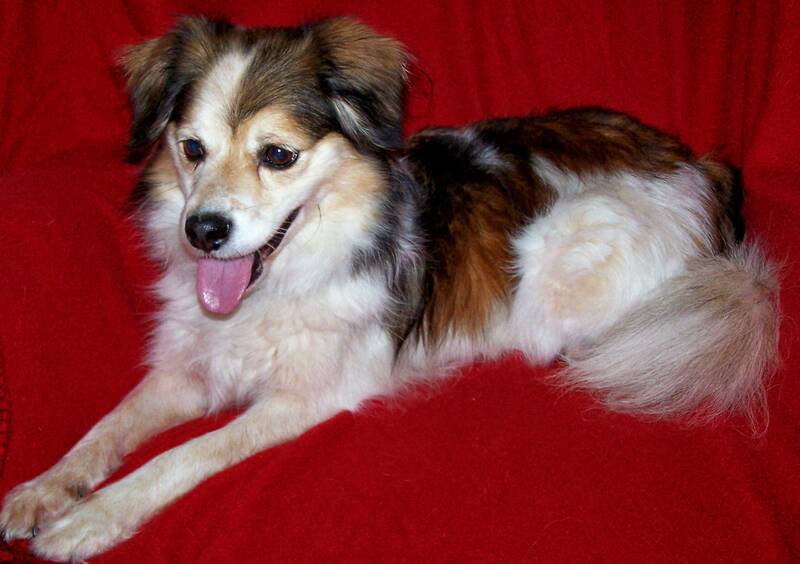 A while back, Real Good Dog Rescue rescued a sweet little Shetland Sheepdog Sheltie mix by the name of Keely. She had been picked up as a stray by a local animal control facility. When we got her, she was none the worse for the occasion, as her sweet and loving personality made her an instant hit with all who met her. Vivian lovingly fostered her and Keely continued her outgoing ways. She particularly loved to play with toys and also enjoyed her grooming visits. Karyn adopted Keely and recently sent us this note to update us on how Keely is doing. Just a quick note to say Hi and let y’all know that Keely (now Cally) is doing great! She and my older girl, Bree, are good together and where Bree is not a real cuddler – Cally is! She loves to be on her back, stretched out on my lap getting her belly scratched. She also likes to pull my arm out of socket tugging on her rope toy! Anyway, I just thought you’d like to know she is settling in pretty well and we will probably do an obedience class this fall. Thanks, Karyn, for letting us know how sweet Keely is doing! We’d love to post some pics of Keely and Bree. Sounds like they balance each other out! 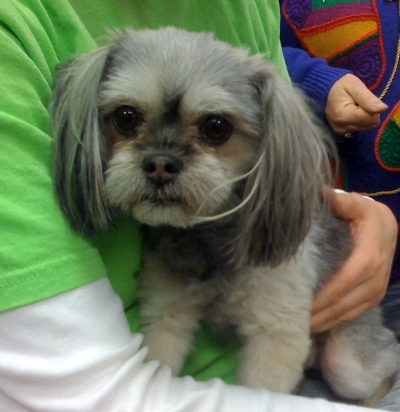 Late last year we got the most adorable petite Yorkie Shih Tzu mix we had seen in a long while. Max was his name and attaching himself to a person was his game! He was so adorable, Founder Lisa had a hard time letting him go. 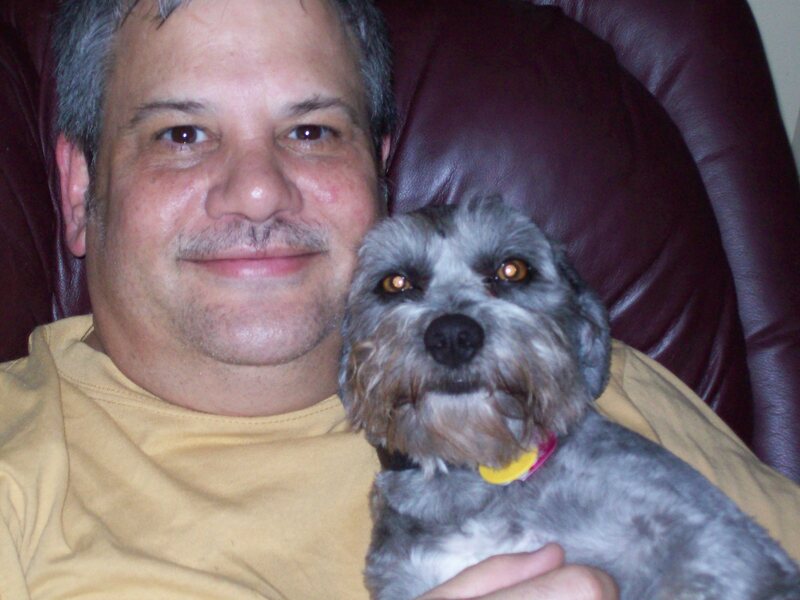 On January 3,2009 we adopted little Max. He is the most incredible little sweetie we’ve known. He plays and has a very special toy which is a duck which he carefully places under the end of our bed every night. Of course he sleeps with us. He licks this duck’s hair as a cat would clean her kitten. He has made our life happier and even has helped to get our cocker spaniel up and around more. He has not had an accident in the house from the day we brought him home. He doesn’t like to get his feet wet. He loves to go for a walk, loves to ride in the car and even the people at our bank and drugstore always give him a treat when we go thru the drive thru. Thanks for allowing him to come to Missouri. We are so very pleased that Max has settled in with the Shelton’s. He is so very representative of our typical “good dog” … adorable and looking for lifelong love with a forever family. Thanks for letting us know how he’s doing. We’d love to post some recent pictures of this sweetie.